Orange Park, Florida. This is one of the finest older boats made, her hull is made of thick hand laid fiberglass that has stood the test of time way beyond others and with very little TLC will be around for many more! She makes a great live a board for 2- 4 will all the storage areas, she sails like a dream for a beginner or experienced racer. The beautiful mill worked Mahogany below adds just enough for a warm comforting feeling and not to much to be a constant labor of love. She has a 30 HP Westerbeke 3 cyl Diesel that runs great and sips fuel, the diesel tank was upgraded to a poly tank about 3 years ago. Must recent upgrades are two new house-banks consisting of 2 T-5 batteries in each (total around 425 AMP Hours). A new 3 bank Zantrac 50 amp charger was added and she has two 45 watt solar panels. All cushions inside and cockpit cushions are in great shape with no reps or tares. Sails and rigging in good shape, 1 main, 2 jibs and spinnaker all in good shape. 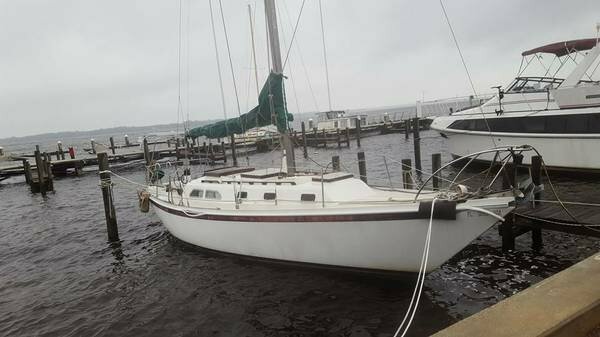 If you have dreamed of sailing I will happily teach the new owner, if you dreamed of the live a board lifestyle this one will most defiantly accommodate you comfortably and not break your bank account.